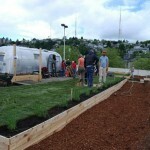 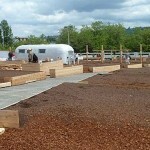 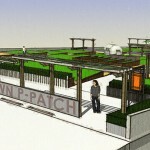 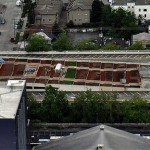 Installation of the first community rooftop garden in the United States—UpGarden—is almost complete. 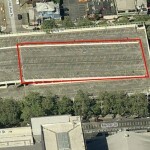 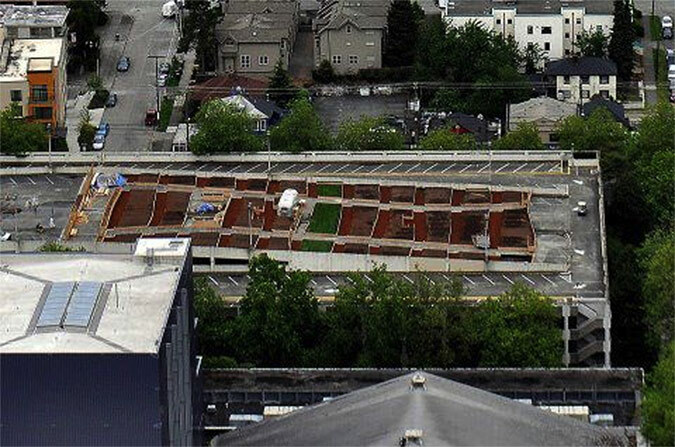 Located in the shadow of Seattle’s Space Needle, the project will convert close to 30,000 square feet on the top of the Mercer parking garage into an organic, edible, herb and flower garden with 100 plots for lower Queen Anne neighborhood residents. 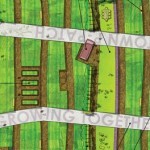 Landscape architecture firm Kistler Higbee Cahoot is leading the design, organizing community workshops and construction of the garden with a volunteer crew. The project is part of the Seattle Department of Neighborhoods P-Patch program, which helps manage almost 80 urban community gardens across Seattle. 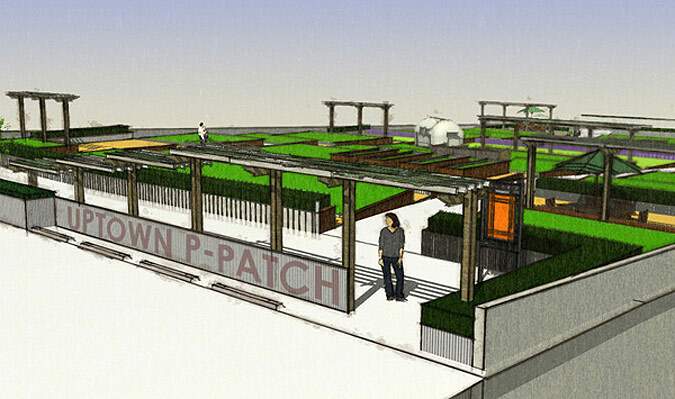 P-Patch gets its name from the Picardo family who donated land to create the city’s first community garden in 1973. 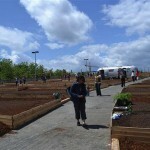 UpGarden was funded by the 2008 Parks and Green Space Levy. 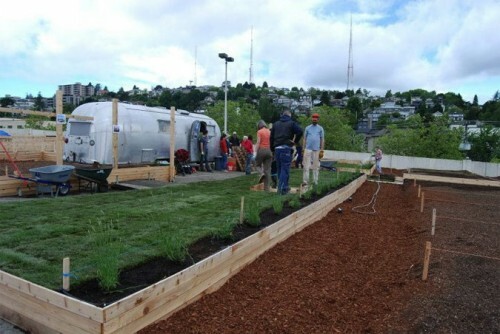 While UpGarden is built on top of a parking garage engineered to hold up dozens of cars, special effort had to be taken to consider the weight of the new garden, which can be quite heavy. 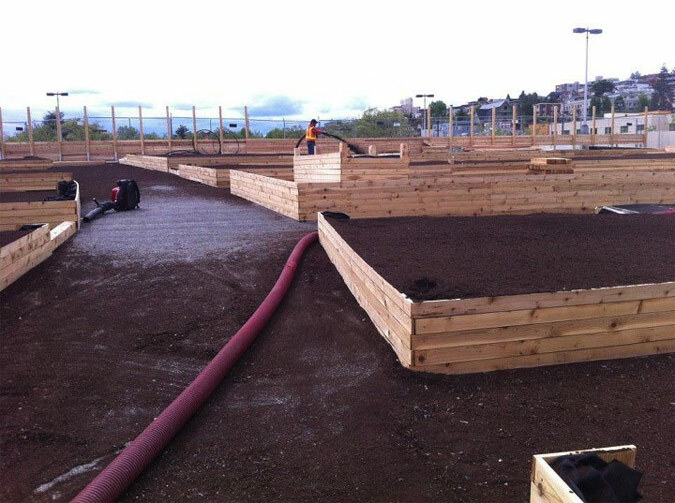 A cubic yard of dry topsoil can weigh about a ton, and much, more when wet, which could overwhelm even a concrete parking structure. 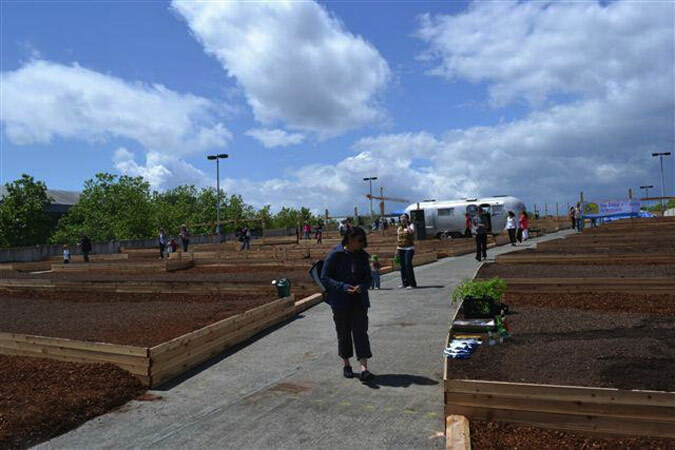 UpGarden’s design accounted for weight by including terraced planting beds with shallower elevated filled with a lighter-weight mix of potting soil. Small seating areas have been incorporated into the landscape design along with a planted trellis and educational kiosk at the garden’s entrance. 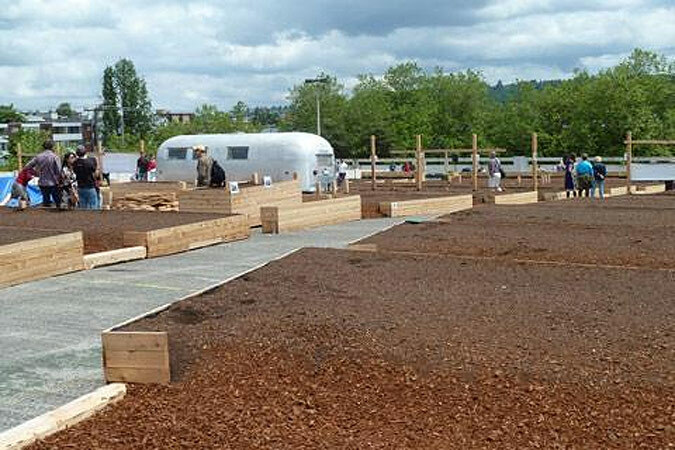 Designers paid homage to the unorthodox site’s automotive past by incorporating an Airstream trailer repurposed for use as a tool shed along a lavender-lined lawn at the center of the garden. 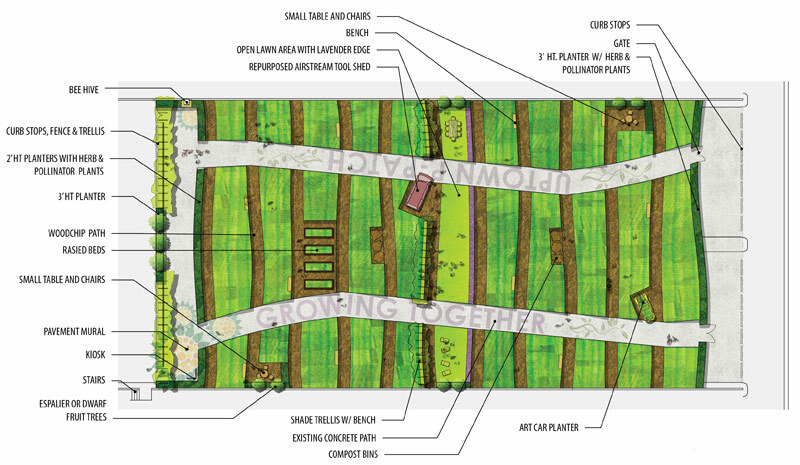 A donated 1963 Ford Galaxy was also repainted purple and hollowed out to serve as a planting space for crops such as corn and pumpkins. 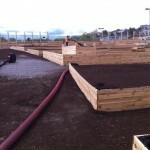 The first crops at UpGarden will be harvested later this summer. 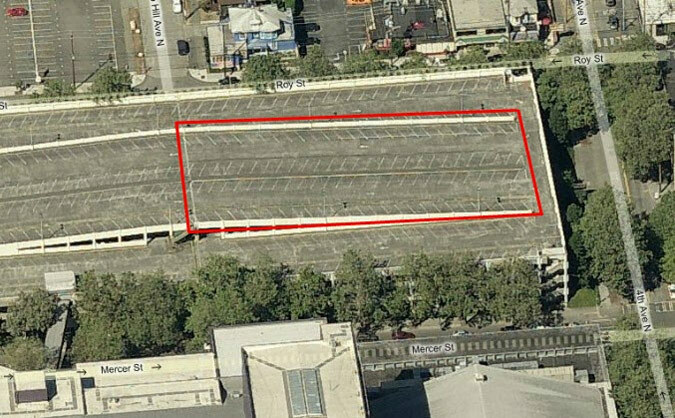 Unfortunately, the garden is only temporary—there are plans to demolish the aging Mercer parking garage, built for the 1962 World’s Fair, in three to five years.